Buanarroti Michelangelo created the sculpture “Bacchus” from marble or it is also called “Drunk Bacchus”. It reaches a height of two meters three centimeters. This was the task of Cardinal Raphael Riardio in 1497. In the opinion of researchers, the sculpture of Michelangelo was the first masterpiece. After receiving the order the sculptor set to work. But the customer refused, so Jacopo Galli, a banker, bought the sculpture. 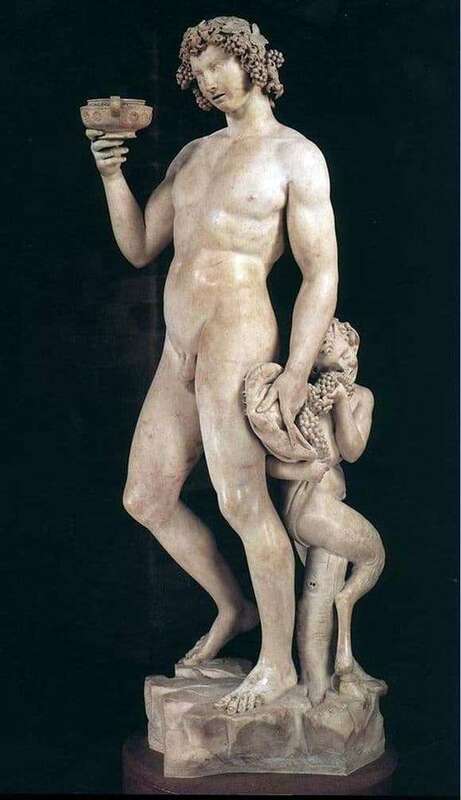 Today Bacchus stands in the Bargello Museum in Florence. This work is done so that it can be viewed in a circle. The sculptor carved the god of wine Dionysus a little drunk, with him is a satyr. Bacchus is naked, in his hand he holds a cup with wine, which he looks at very carefully. Although his posture is not quite stable. He is about to fall, but he keeps his balance, leaning back. The young man’s back is tense, the muscles stand out, but the stomach and hips are depicted so that Dionysus’s physical and spiritual weakness is immediately visible. In the other hand, which is lowered, is the skin and the bunch of grapes. Behind the young man is a small satyr who accompanies the hero constantly, he eats grapes. If you look closely at the goat-footed satire, you can note its uniqueness. On his face one can see a carelessness, a cheerful smile, he slowly steals berries from Bacchus. This composition is the only Michelangelo’s, which shows exceptional fun, he never returned to such a topic. The great sculptor created the creation, with which he achieved the impression of unbalance and instability of the entire composition. All the technical characteristics were observed correctly, for a better support of the large statue he added the composition with hemp, on which satyrenok sat. So the author’s compositional idea was not spoiled.